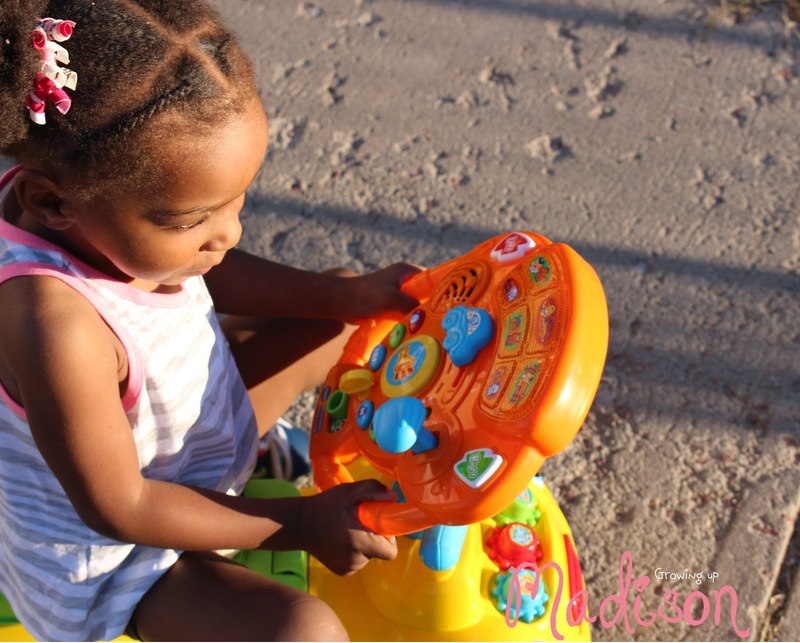 I have been a fan of VTech ever since I was a baby and have gotten quite a lot of their products. I was introduced to the Sit to Stand Walker when I was about 6 months old and I think it really helped me learn to walk. Then for my first Christmas mommy got me the VTech Activity Cube and my passion for learning began. 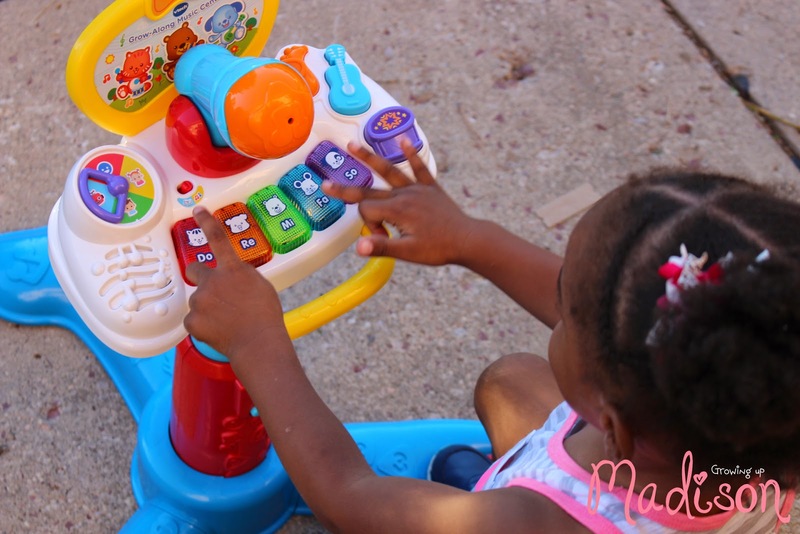 All the VTech toys that I've owned have all enhanced my love of learning and have taught me quite a lot. You’re never too young to learn! VTech believes in the power of making learning fun, even at an early age, with a wide variety of educational toys. I was given the opportunity to try VTech’s Chomp & Count Dino™, Sit-to-Stand Smart Cruiser™, Grow-Along Music Center™, and Smart Shots Sports Center™. All are made for children up to 36 months which I'm not quite there yet but will be very soon. Because I'm reviewing all 4 products in one review, I very rarely do that, I'm going to skimp on the photos or this would be one very photo laden post, and I really want to highlight the features of each one. 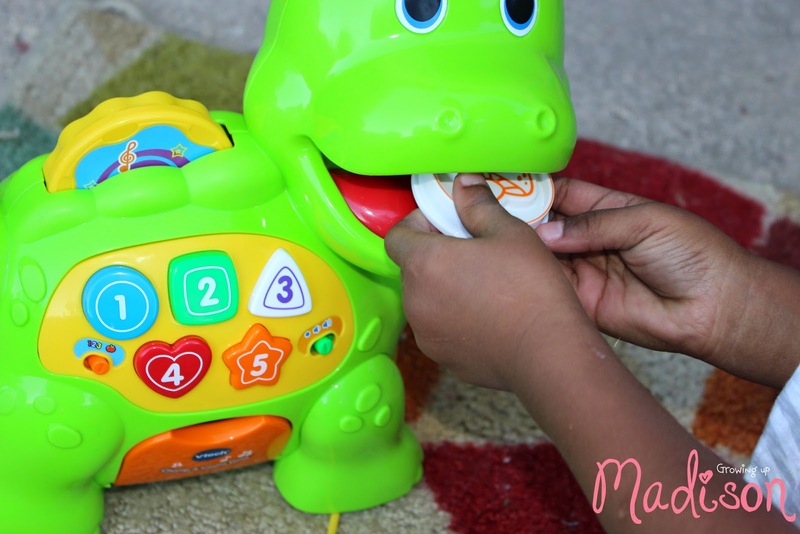 Your child will learn about colors, numbers, and food with the adorable new Chomp and Count Dino. I actually had a lot of fun with this one. Out of all the toys this was by far my very favorite. 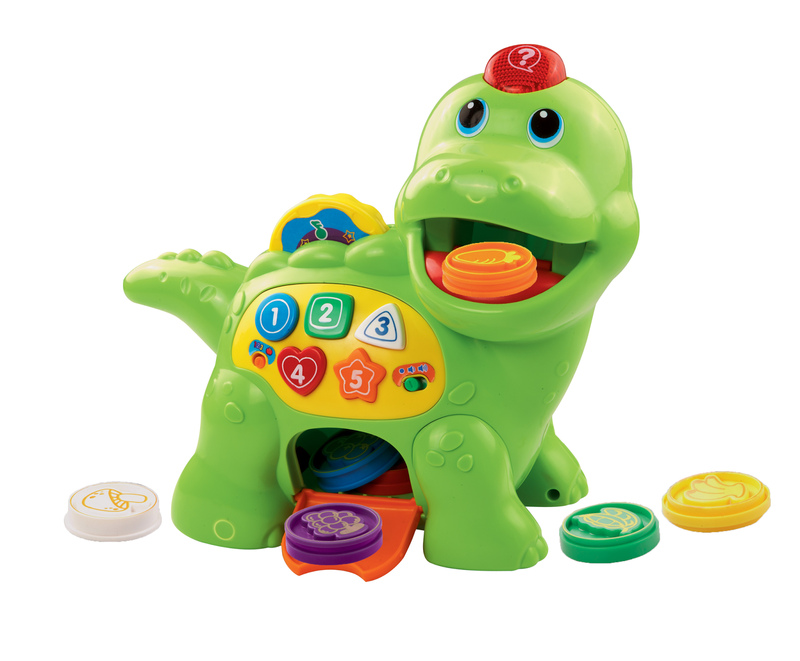 The Chomp and Stomp Dino comes with 8 brightly colored play pieces that teaches food and colors. I was very surprised when I put the yellow colored piece in his mouth and he recognized that it was a banana. He has a 123 mode in which he counts each piece when you put it into his mouth. Press the question button and answer the dino’s questions to show what you’ve learned. The little door that you see above closes shut and secures the pieces when I'm not playing with him keeping them safe for another time. He sings some cute little songs that I'm also learning to sing along to and I can also sing along by turning the wheel on his back. As I said this is by far my very favorite of all! As I mentioned all these toys are made for toddlers up to 36 months. 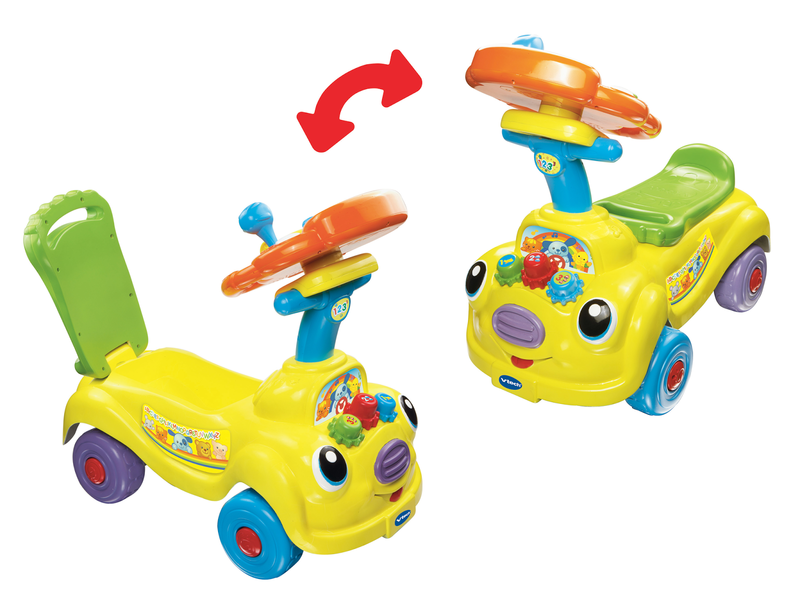 This toy grows with your child and transforms from a floor toy to a ride-on. The Sit-to-Stand Smart Cruiser has an interactive steering wheel that includes driving, learn and music modes. It is detachable and can be used as a stand alone or an activity panel for when your little one is riding. You can press the horn for a realistic sound. There are 6 animal buttons that your little one can learn about and you can also choose one of six places to drive to. Your little one will learn the concept of direction and road safety with the arrow buttons. The seat can also be used as a storage space for your little one's small toys. I love music as most of you know and it was fun trying to make up my own music. The microphone that is included is a fun voice changer and I would try and sing into it to hear my voice sounding not quite like me. The three instrument buttons plays guitar, drum and saxophone sounds. There are also five animal piano keys that teaches me instruments, colors and animals. You can also choose between Learn and Play mode and Sing Along mode. The stand is height adjustable so it grows along with your little one. This certainly makes me feel like I'm going to be the next American Idol. This has got to be my second favorite of them all. Daddy is very much into sports and I mean almost all sports, well except for soccer. Mommy on the other hand loves soccer and can't get enough of it. She played soccer while in college and grew up in the Caribbean where soccer is called football. She and daddy argue about that all the time. According to mommy it's played with your foot with a ball so the name is football. Guess I can't argue with that logic. 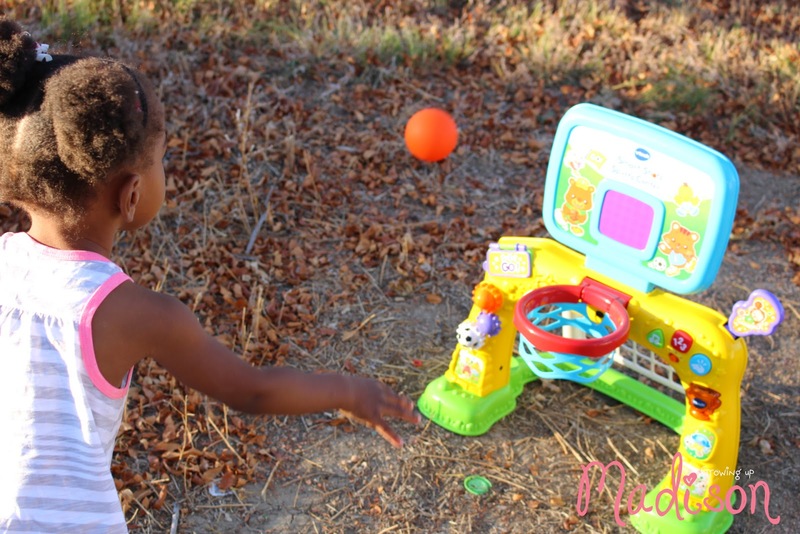 The VTech Smart Shots Center is perfect for not only indoors but outdoors as well. Mommy loves us being outdoors so she set this up outside for me and I have to say that we have been having amazing weather lately. I'm able to try and toss the basketball in and the screen lights up and lets me know how much baskets I've made. In addition to counting baskets, the LED screen also encourages me to play with fun animations. Daddy even makes it a bit of a challenge and have me standing a distance away so I can make my shot. I also can kick the soccer ball into the net and Smart Shots Center responds with encouraging sounds and phrases. Turning the gears on the sports center allows me to hear sounds and the shape buttons teaches shapes and numbers. This certainly keeps me active and helps me to build my motor skills. 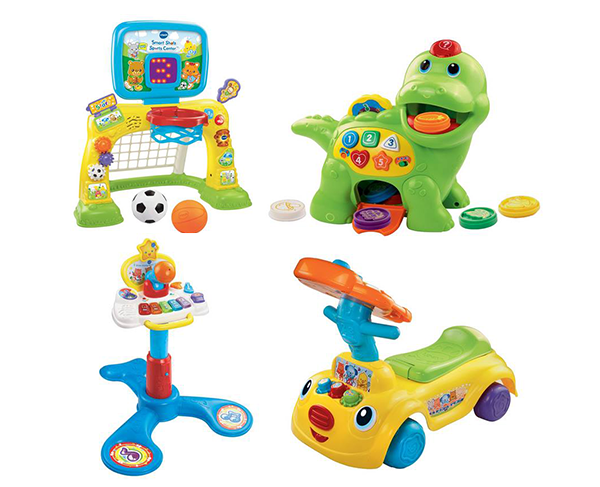 While I am loving all of these toys that VTech sent me of course I have my favorites which I've told you about. They are all really great products and can be used much longer than the suggested age that is listed. All teach a variety of things and make learning fun while doing so. That's why VTech gets my TWO TINY THUMBS UP! So which is your favorite and why? I would love to know. My favorite is the Vtech Smart Shots Sports Center it would keep the kids busy for a long time and looks fun! My son would love the basketball game. He has one that hangs on the door but this one talks and counts so he would enjoy it much better. I love them all and so would Davin but that sit to stand is sweet!! oooo, so hard to pick a favorite! I love the Vtech Smart Shots - my 3 little ones would have a blast with that for a long time!! fixing comment the dinosaur is my favorite because he is sooo cute! My fav is the Chomp and stomp Dino, love how it counts and recognizes the items u put in its mouth! My favorite is the VTech Sit-to-Stand Smart Cruiser because my son would be having fun, learning, and moving all at the same time! My favorite is the VTech Smart Shots Sports Center because it has multiple sports for my little one to play with this toy. The VTech Smart Shots Sports Center is my favorite, my daughter would feel like part of the team with her two brothers who plays basketball none stop. 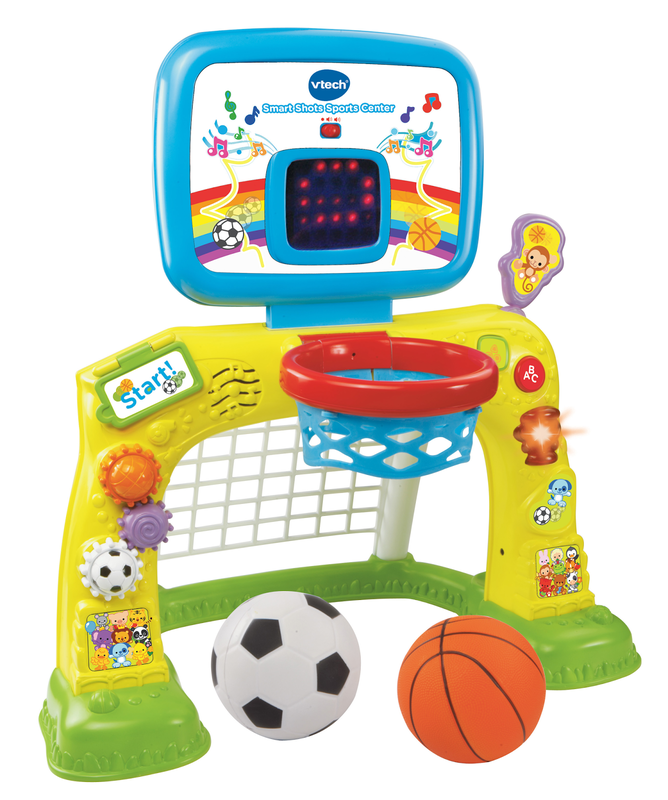 My favorite is the Vtech Smart Shots Sports Center my kids would love it! The Smart Shots center is my favorite, because my son loves playing ball of all sorts, and he would also enjoy the sounds. 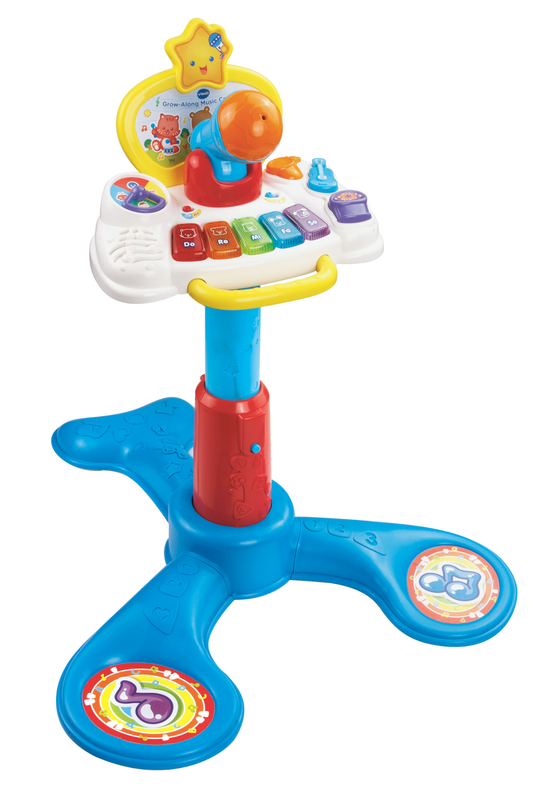 Our son would love the VTech Grow-Along Music Center - he is always listening to music and dancing. He would love it! I like the Music Center. I love all kinds of music and there's nothing like making your own music! I love the basketball one, it keeps the kiddos up and moving and looks like it has a ton of extras added!!! My husband loves every kind of sport too, I definitely think the VTech Smart Shots Center would be a hit! The VTech Smart Shots Sports Center because my girls are all about throwing balls right now. Thank you for the wonderful giveaway. The Chomp and Count Dino is my favorite. That's a cute (and fun) way to teach the little ones. The music center is def my favorite and most likely my daughters as well. My boys are all aobut playing with balls so my favorite would have to be the VTech Smart Shots Center. I love them ALL!! I think I love the Sports and the Dino the most though. These would make the perfect gift for any child this Christmas. Awesome giveaway!!! My favorite is the Grow Along Music Center. My granddaughter loves to sing and I know this would be her favorite! I LOVE LOVE love the Grow along music center. I am a huge believer that opening the door to music for your child opens a whole new world to them. It teaches them a whole gamete of other things as well. I have proven time after time that music soothes & calms all ages of humans. From tots to grands & all ages in between. Any time I am trying to teach a new concept if I set it to music the child I am working with recalls the information SO MUCH faster! It is quite amazing. I think I like the Grow Along Music Center the best. Cute that they can sing along! These all look like a lot of fun. I think I like the smart shots sports center the most! The VTech Grow-Along Music Center! My son loves dancing so I know he would love this! Smart Shots Sports Center my son is always throwing or kicking balls around!! Oh I think he would love the VTech Smart Shots Sports Center the most, but he really would love all of them! Vtech always makes the neatest toys! The girls love making music so the drum would be great! I love the Sports Center! My toddler loves sports so this would be a perfect and unique gift for him! My favorite is the Smart Shots because little ones love anything to do with balls. My favorite is the VTech Sit-to-Stand Smart Cruiser because it's great for two different stages of babyhood. The Sit and Stand Smart Cruiser is my favorite because it is perfect for my little rug rat! I think my favorite is the Chomp and stomp Dino. My son loves dinosaurs and I really like how it counts and recognizes the items you place in his mouth. Music center. My grandivas love to sing and dance! The VTech Grow-Along Music Center. Music is very important to children and their development. I think I likeVTECH Grow Along Music Center best. My grandkids don't have much exposure to that. My daughter would love the sports toy!! The dino is just adorable! My daughter would love him! the dinosaur is my favorite because he is so cute and my nephew would love it!